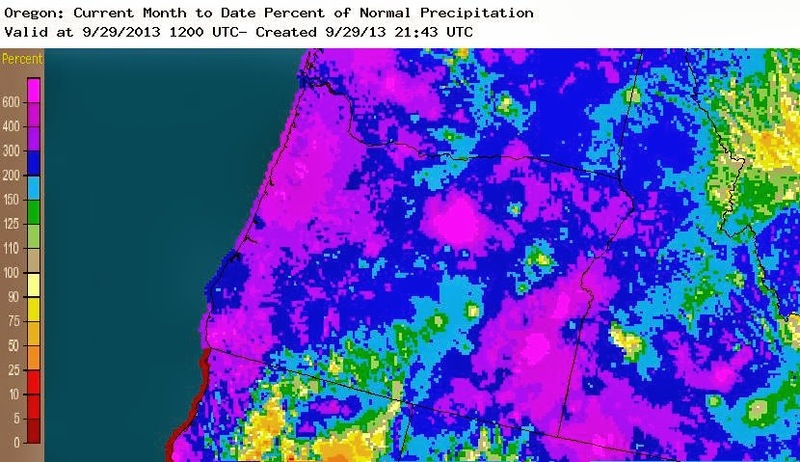 September 30 Update: September monthly precipitation records have also been set in Oregon at Eugene, Hillsboro, McMinnville (second highest), Portland (downtown and airport), and Salem, as well as at Vancouver, Washington. Details have been added below. Driven by persistent abnormally low pressure in the northeastern Pacific, an early onset of the rainy season is smashing precipitation records for September in the Pacific Northwest. Through this morning, Astoria, Oregon had broken century-plus records for all-time wettest September (by over 1"), wettest September day (by almost 1"), and wettest 2-day and 3-day totals for September. These records were further extended by the 2.00" which had fallen through 4 pm this afternoon, tying the daily record for Sept. 29 from 1951 and bringing the monthly total to date to 10.10", which is just 0.10" less than 500% of normal. 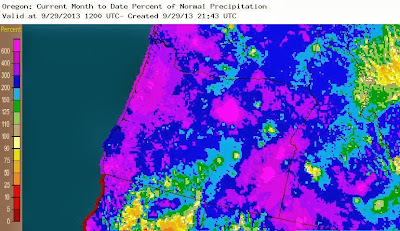 The rainfall map above shows that large parts of coastal Oregon have seen precipitation for the month of September to date (through the 28th) which is over 400% of average, with some areas over 600%. KEPT IN ASTORIA SINCE 1890. 1. SEP 2013......... 9.70 INCHES AND COUNTING. 2. SEP 1906......... 8.66 INCHES. 3. SEP 1920......... 8.55 INCHES. 4. SEP 1905......... 7.38 INCHES. 1. SEP 28 2013...... 3.56 INCHES. 2. SEP 16 1997...... 2.67 INCHES. 3. SEP 30 1953...... 2.41 INCHES. 4. SEP 13 1935...... 2.27 INCHES. 3. WETTEST 2-DAY TOTAL FOR SEPTEMBER...TOP 2 NOW SET IN 2013. 1. SEP 28-29 2013... 5.16 INCHES AND COUNTING. 2. SEP 27-28 2013... 4.55 INCHES. 3. SEP 3-4 1913..... 3.46 INCHES. 4. SEP 16-17 1997... 3.42 INCHES. 1. SEP 27-29 2013... 6.15 INCHES AND COUNTING. 2. SEP 2-4 1913..... 4.31 INCHES. 3. SEP 15-17 1997... 4.16 INCHES. SEP 28TH. THIS BREAKS THE OLD RECORD OF 0.82 SET IN 1971. AIRPORT ON SEP 28TH. THIS BREAKS THE OLD RECORD OF 0.83 SET IN 1948. SEP 28TH. THIS BREAKS THE OLD RECORD OF 1.02 SET IN 1962. ON SEP 28TH. THIS BREAKS THE OLD RECORD OF 1.32 SET IN 1971. 1. SEP 2013......... 10.51 INCHES AND COUNTING. 1. SEP 2013......... 6.16 INCHES AND COUNTING. 2. SEP 1927......... 5.21 INCHES. 3. SEP 1911......... 4.91 INCHES. 4. SEP 1986......... 4.65 INCHES. 1. SEP 2013......... 6.10 INCHES AND COUNTING. 2. SEP 1945......... 3.68 INCHES. 3. SEP 1982......... 3.46 INCHES. 4. SEP 1977......... 3.43 INCHES. 1. SEP 1996......... 7.58 INCHES. 3. SEP 1901......... 4.83 INCHES. 4. SEP 1914......... 4.28 INCHES. 1. SEP 2013......... 5.06 INCHES AND COUNTING. 2. SEP 1986......... 4.30 INCHES. 3. SEP 1982......... 3.98 INCHES. 4. SEP 1945......... 3.96 INCHES. 1. SEP 2013......... 6.21 INCHES AND COUNTING. 2. SEP 1927......... 5.52 INCHES. 3. SEP 1911......... 5.19 INCHES. 4. SEP 1969......... 4.87 INCHES. 1. SEP 2013......... 6.63 INCHES AND COUNTING. 1. SEP 2013......... 4.98 INCHES AND COUNTING. 2. SEP 1911......... 4.88 INCHES. 3. SEP 1925......... 4.46 INCHES. 4. SEP 1927......... 4.35 INCHES.